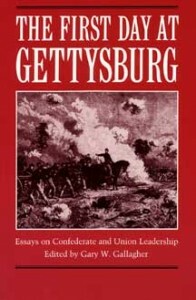 The Battle of Gettysburg exerts a unique hold on the national imagination. Many writers have argued that it represented the turning point of the Civil War, after which Confederate fortunes moved inexorably toward defeat. Successive generations of historians have not exhausted the topic of leadership at Gettysburg, especially with regard to the first day of the battle. Often overshadowed by more famous events on the second and third days, the initial phase of the contest nevertheless offers the most interesting problems of leadership. In this collection of essays, the contributors examine several controversial aspects of leadership on that opening day including Lee’s strategy and tactics, the conduct of Confederate corps commanders Richard S. Ewell and A.P. Hill, Oliver Otis Howard’s role on the Union side, and a series of notable debacles among Lee’s brigadiers. Drawing on a range of sources, the authors combine interpretation and fresh evidence that should challenge readers to reconsider their understanding of the vents of July 1, 1863. Gary W. Gallagher is professor of history at the University of Virginia. He is a contributing editor of The Kent State University Press publications Antietam: Essays on the 1862 Maryland Campaign (1989); Struggle for the Shenandoah: Essays on the 1864 Valley Campaign (1991); The Second Day at Gettysburg: Essays on Confederate and Union Leadership (1993); and Three Days at Gettysburg: Essays on Confederate and Union Leadership (1999).